I shared my blog with my brother Zulfi Haja, he is a SQL Server Consultant too and works for an investment bank in London,UK. Having reviewed the top 5 features of SQL Server 2014, He shot me an email saying, Bro the effort you put on summarizing the top 5 features was worth reading and it’s a neat approach, would definitely recommend it to my colleagues, but I am still not convinced for an upgrade to SQL Server 2014. Can you help? I thought only a Tech Evangelist from Microsoft will be able to answer him. I took the question from him with a little hesitation and replied back saying, “I don’t know how long will it take but surely will get back to you once I find a convincing answer”. He said, All the best!! Was looking out for users experience with Enterprise 2014 version across my network circle and over the blogs, it was of no use. In the beginning of May I joined a local SQL Server User group and they invited me for their monthly meeting. To my surprise there was a presentation about In Memory OLTP and SQL Server 2014 by a Product Specialist from Microsoft. I said to myself, I found the guy and this Product Specialist and Tech Evangelist should be the one to answer my question. His presentation was very convincing enough and I found the answer from his talk. After the presentation the Q&A session was open and I asked him the same question and he gave me the expected answer from presentation. It is SQL Server 2014 can now support Tier1 application. Let me elaborate this, if you have hanged out with a developer crowd from different domains they have this pre destined notion with them where they will give you an analogy, Oracle is like a business class of a flight and major critical applications are built using it and SQL Server is like an economy class where middle tiered companies uses it. In fact, of all my projects 60-70% of them will be the front end applications supported by Oracle and we had the data replicated to us in SQL Server environments for our reporting and analysis purposes. With SQL Server 2014 that pre destined notion is no more and as per my conversation with the Tech Evangelist, SQL Server 2014 will be good enough to support Tier1 applications and compete with Oracle supported systems because of its new DB engine design. Also he hinted out saying, if NASDAQ uses SQL Server why not your applications? 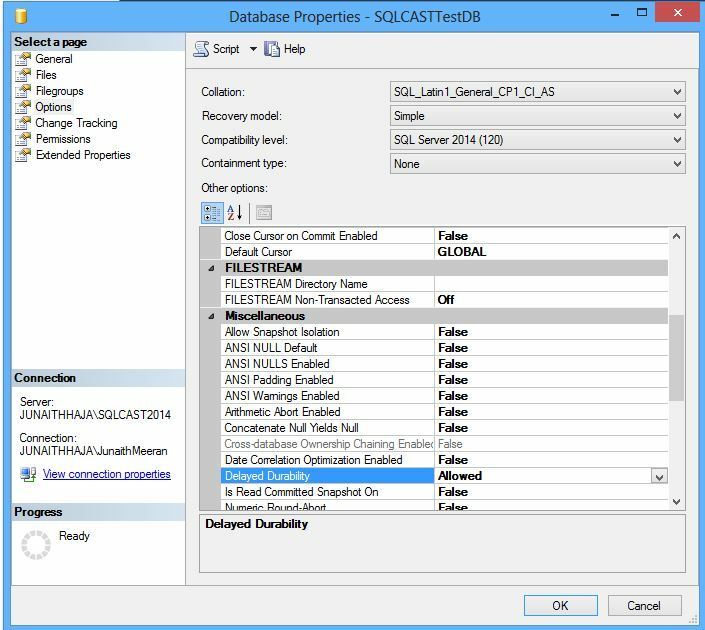 This entry was posted in All Articles, SQL SERVER 2014 and tagged Delayed Transaction Durability, Full Transaction Durability, In Memory OLTP, Junaith Haja, Memory Optimized Tables, SQL Server 2014, SQL Server Developer, Visual Studio 2013 on June 21, 2014 by Junaith Haja.